*voluntarily and honestly reviewed the ARC I received from NetGalley* Wow. The writing was beautiful, the story was entertaining and I devoured the whole thing in a sitting. Another thing I must point out is that I struggled with getting the reading material provided, and it left me in a really bad mood, but this story was so good, it got me out of the funk. If any book can change your day, it's a book worth checking out, which is something I highly recommend. Esta was an interesting character to follow, and while the whole book's told through multiple POVs, I thought it really worked. Loved the timeline, loved the variety of personalities. The pace worked well with the intensity levels and it just all flowed amazingly. I don't always come across a writing style like this but I suspect it'll soon be on everyone's shells. All I'll say is that it's beautiful writing, beautiful story telling, and a beautiful tone with the perfect blend of action, romance, suspense and thriller. It's a definite recommend. Time travel isn't usually my thing. It usually makes my head spin. But I gave this book a shot because I wanted to read something new, and the back blurb and cover really caught my attention. In the end, I don't think this book was for me, but the ending was really exciting and filled with twists, and I enjoyed much of what I read. The story was very well constructed and kept me going. The world building and magic were interesting and unique. There were tons of betrayals and nobody trusted anyone, which helped with the drama and suspense, and ultimately led to some shocking moments at the end. For the most part, I enjoyed the characters. Everyone got their time in the spotlight and many crossed paths with one another, but there were some traits of certain characters that annoyed me. I found Esta to be way too reckless in everything she did, to the point where it was almost cruel the way she was treating some people, and I'm a little conflicted on Dolph. Harte was one of my favourite main characters, but definitely think he was too stubborn at certain points. The book was more tension driven action than anything else, and sometimes things would happen that didn't make sense (seriously, were all the buildings in 1902 made of matchbooks? So much fire! ), but I was able to continue on without losing interest. The biggest challenge for me was remembering everything I needed to remember. The book is so big and sooooo much is going on, that I would need to take a second to remember it all, thus breaking my immersion a little bit. But that's really my only nitpick. Despite not capturing my entire interest quite like I wanted it to, THE LAST MAGICIAN is still a well written adventure for anyone who loves magic, twists, and betrayals on nearly every level. The final few chapters are truly head-spinning, and I'm ready to begin the sequel and see where it leads from there! 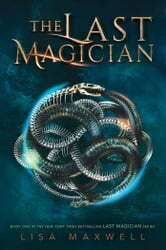 Rate: 4.5/5 The Last Magician by Lisa Maxwell is a Young Adult urban fantasy story set in New York. The world described by the author is compelling, there are always fewer people who can sense and use the Old Magic, while they're hunted by the men of the Order of Ortus Aurea. Those who live in New York, are trapped in the city because of the Brink, something like a barrier which removes the power of whoever trespasses it. Esta Filosik is a Mageus and she can travel-time, but to do so she needs an artifact she has destroyed. This is the reason why she can't return back to her time, so she decides to join Dolph Saunders crew of Mageus. His dream is to break the Brink in order to free his people from their lives of terror, servitude and violence. I really loved the protagonist, Esta. She is strong, intelligent and cares deeply for the people she loves. Harte Darrigan seemed a little selfish most times, but it might as well have been the result of what happened to him since he was a child. He doesn't want to be involved in Dolph Saunders' plan to free the Mageus from the Brink, but he's vital for the mission to go well. The only family he has is her mother, he would do anything to keep her safe and sound, but sometimes it's difficult to help someone who doesn't want to be helped. I loved Dolph Saunders, after losing someone very important to him, he was swallowed by grief, but those dearest to him helped him to keep living. What about Viola? I really loved her background. It helped me to know better her character. Another character I loved was Jianyu. He was intelligent and wanted to prove his true loyalty. The book was well written and I really enjoyed the book. I totally recommend it! An excellent blend of suspense and mystery. The detail to the time and period the book is set in made everything come alive. High stakes and fast planning. A heist story with some clever bits of mystery hidden under the ink.